Seems like everybody makes tapenade these days- it's so popular you can buy it in jars in most stores. But why do that when you can make your own, fresh, in minutes? 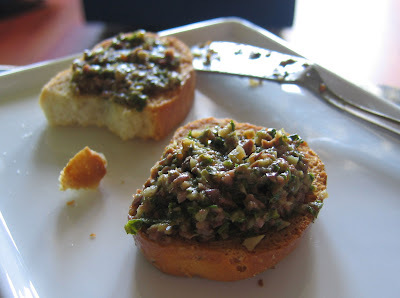 Use a good, toasted, crusty bread to help diminish the saltiness of the tapenade. Do not use canned olives! Make the effort to pick up good deli olives. Use this as an appetizer, or on picnic sandwiches for a fat and happy surprise flavor booster! olive oil, enough to just hold it all together. Place all the ingredients in a mini Cuisinart and pulse lightly until the tapenande is to the texture of your liking. I suggest leaving this somewhat chunky for the best results.